By delaying a diversion of sales tax money for transportation projects, Texas Senate leaders said they had an additional $2.5 billion to spend on needs such as health care and schools. Texas Senate budget writers on Wednesday unanimously approved their two-year budget, which avoided some steep cuts by using an accounting trick to free up $2.5 billion state dollars that are slated for the state highway fund. By delaying a diversion of sales tax money from August 2019 to September 2019, and therefore moving the funding from the 2019 fiscal year’s budget to the first month of fiscal year 2020, Nelson said her two-year budget had an additional $2.5 billion to spend on needs such as health care and schools. The accounting maneuver “solved a lot of our problems,” Nelson told reporters shortly after her Senate Finance Committee approved the budget unanimously. She said the move would not affect the Texas Department of Transportation’s ability to pay for highway projects in 2019. “Counting money twice in order to balance a budget is not a good idea,” Straus told reporters Wednesday morning. “This is the Texas Legislature. We are not Enron.” He was referring to a Houston-based energy company that collapsed in spectacular fashion because of fraudulent accounting practices. Nelson downplayed the concerns, saying the move had received approval from the office of Comptroller Glenn Hegar. 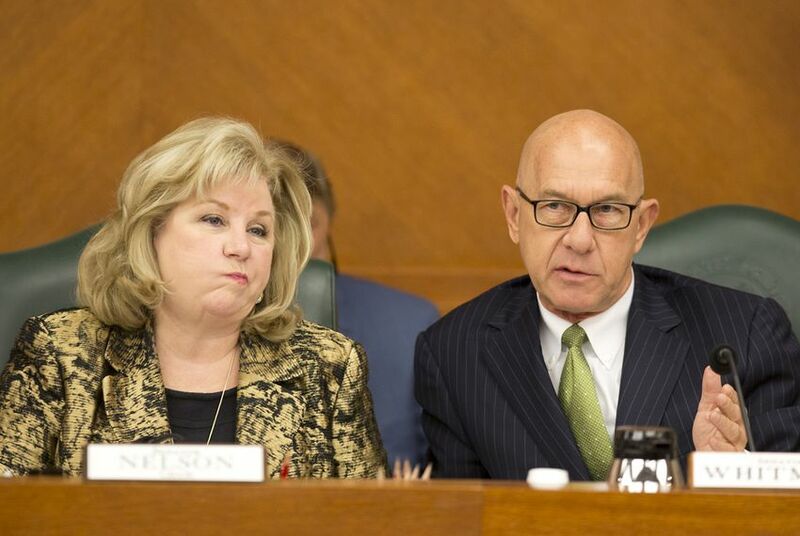 “I know people are nervous about this,” she told committee members when asked by state Sen. Paul Bettencourt, R-Houston, about the budget trick, which was first made public Wednesday morning. “This doesn’t take any of that transportation money” that was overwhelmingly approved by voters in a 2015 constitutional amendment election. Responding to Straus's criticisms, Nelson said in a prepared statement Wednesday that her plan was "a smart money management decision that allows us to responsibly meet our needs without raiding the Rainy Day Fund." In committee, she said the budget “meets our responsibilities” and “keeps Texas on the path to success and prosperity.” The proposal now moves on to the full Senate, where a full chamber vote is expected on Tuesday. Nelson told reporters the Senate had no appetite to use the state’s Rainy Day Fund, a $10.2 billion savings account lawmakers have available to address budget shortfalls or emergencies. Straus and his House lieutenants have favored using about $2.5 billion from that fund. Nelson’s maneuver, he said, was financially unsound. “I’m not interested in cooking the books just to avoid a vote on the Rainy Day Fund,” Straus said Wednesday. The Senate’s proposed budget would spend $106.3 billion in state revenue, which is a significant bump from the $103.6 billion budget Nelson originally rolled out in January. Still, some cuts are on the horizon in this tight-fisted budget year. Under Nelson’s proposal, some $400 million in “cost-containment” measures would come from the state’s health and human services programs, primarily in Medicaid, the federal-state health insurance program for the poor and disabled. And public universities in Texas can expect some heartburn as their budgets are projected to face cuts of 6 to 10 percent, according to the Senate Finance Committee. State lawmakers have less money at their discretion this year when crafting the next two-year budget. By cutting taxes in 2015, the Legislature reduced state revenue available to them by about $4 billion. Lawmakers also backed dedicating nearly $5 billion that year to highways — a move that voters later approved in a statewide election — which left fewer dollars for priorities like health care and education. Senate budget officials said Nelson’s proposal includes $2.65 billion to cover student enrollment growth, though more of the 2017 budget’s education funding would come from local taxes — rather than state dollars — in comparison to the budget passed in 2015. It also offers $65 million for a “public-private partnership” for pre-Kindergarten programs — but doesn't fund the “high-quality” pre-K initiative touted by Gov. Greg Abbott. And it puts $430 million more into Child Protective Services and foster care compared to the 2015 budget, but that's still less than half of the additional $1 billion the child welfare agency has said it needs. Nelson’s budget would also add $316 million to mitigate a shortfall in the Teacher Retirement System, which offers pensions to retired educators. And it adds $244 million for mental health services, Nelson's office said. Lt. Gov. Dan Patrick, who leads the Senate, praised his chamber's budget, saying in a prepared statement that Nelson's proposal "fully funds K-12 education and actually increases spending on health care, including Child Protective Services" without raising taxes or using the Rainy Day Fund. “We had to make some tough decisions, but we made them together and really stuck together on our priorities, too,” Nelson said of the Finance Committee's work. While Senate leaders oppose using the state's Rainy Day Fund, House budget leaders this month recommended withdrawing almost $2.5 billion to pay for the needs of a growing state in a tight budget year. Though the House and Senate budgets are now closer in value, when first proposed the chambers were nearly $8 billion apart.